Comfortable Farming is a phrase we have coined for how we operate at Moffitts. Our system of farming in conjunction with nature has evolved since the 1980s but has been fully in place since the year 2000. 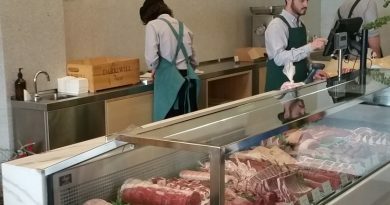 We have found that our way of farming is comfortable for the livestock, comfortable for the environment and comfortable for the farmers – despite the increasingly variable climate. 1. 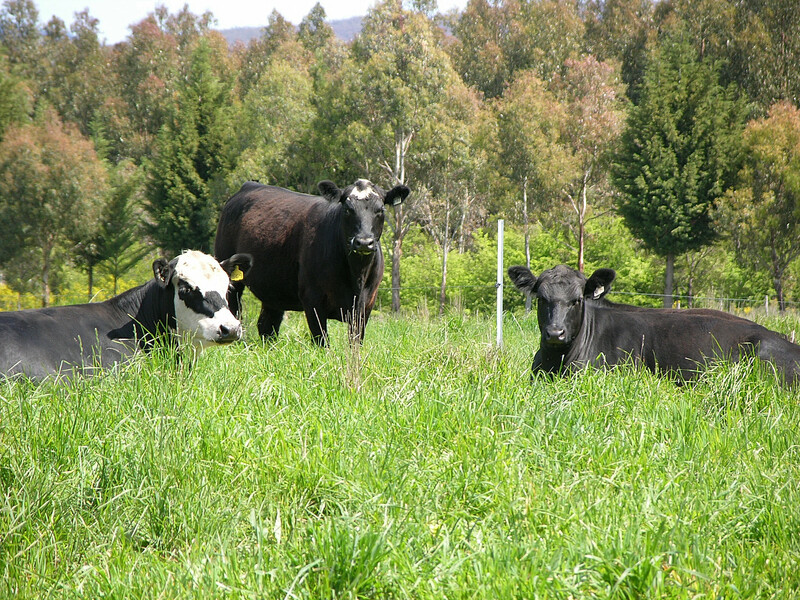 Allowing the grass to grow much bulkier and taller than conventional practice – developing a ‘living haystack’, so the livestock feed from pasture all year round. This differs from conventional systems where farmers make hay (or silage) when the grass grows fastest in spring, and maintain relatively short pastures the rest of the year, feeding out the hay when there is little feed left in the paddocks. 2. 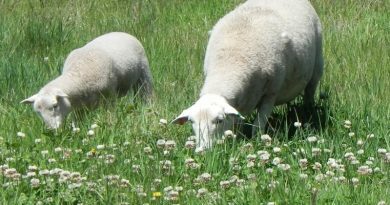 Many paddocks to enable long grazing rotations – animals stay in each paddock for 4 to 10 days and do not graze that area again for at 8 – 12 weeks. The principle is to always have a minimum volume of grass in a paddock when the herd/flock leaves, in our case 2000kg of dry matter per hectare (note: this is often the figure that conventional farmers use as a maximum level of feed, a signal that a paddock is ready to be grazed). 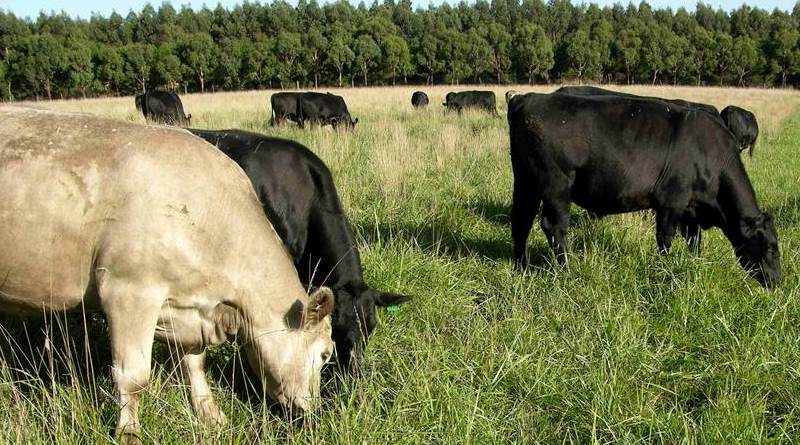 This system means the pastures are never ‘eaten out’ over summer, thereby avoiding ecosystem degradation, pasture species loss and higher costs of production associated with restoring pastures. 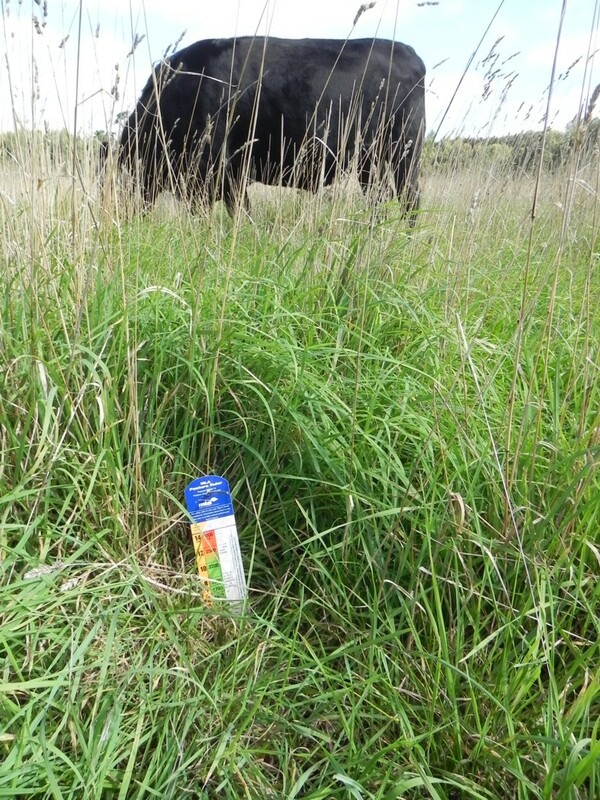 The long grazing rotation not only helps the grass and soil ecosystem to remain healthy and biodiverse, but allows the farmer to determine well in advance if a reduction in livestock numbers will be required, due to a dry spell. If rains suddenly stop, there is still up to 3 months worth of feed that will at least maintain an animal’s weight, even if the grass becomes too dry to enable the animal to put on weight (its protein and energy content has declined). Some farming systems use short rotations to provide some rest to pasture and to avoid eating out of all pasture, however these tend to require the addition of fertiliser to ensure grass grows back quickly in time for the next grazing period. 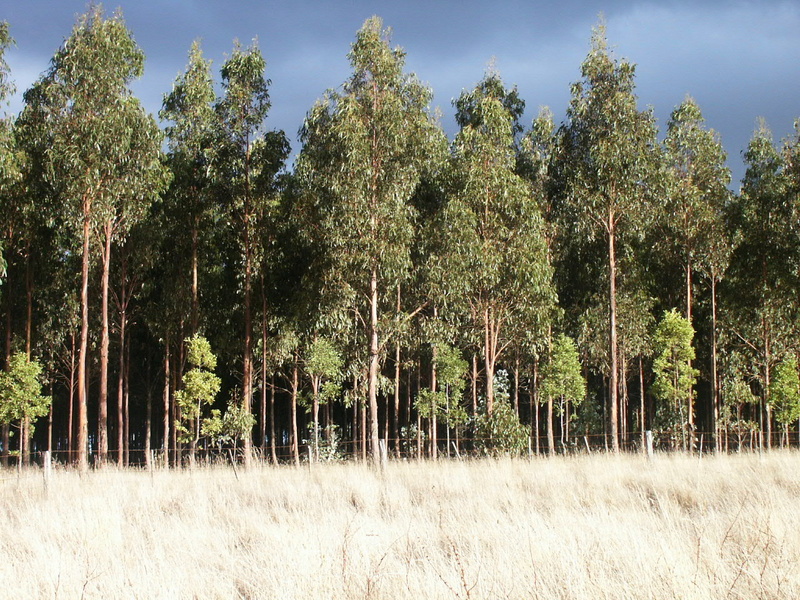 Several eucalyptus species have been planted across the farm either as habitat or for forestry (timber and firewood). 3. 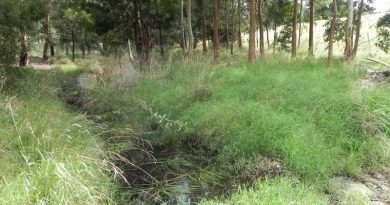 Rehabilitation of degraded areas, this can include improving degraded soils and pastures, where some external nutrients or new seeds may be necessary to start the system off. (Once operating with the long rotations the soil biology improves and fertility levels are maintained without the need for additional fertiliser for a considerable number of years). In our case, where the farm had a degraded creek line and very few native trees, rehabilitation involved fencing off the creek, creating artificial water sources for livestock, and planting trees and shrubs. 4. Integrating farm forestry into the mix. This provides an extra resource on the farm, creates habitat, and is a valuable source of shade for livestock during heatwaves and shelter during cold, windy days (once the trees are large enough not to be damaged by livestock). 5. Low stress animal handling. Along with many other farmers in Australia, we have learned from Bud Williams, who is from the United States, about low stress stockmanship. We have now moved past just using low stress herding, to a point of hardly herding at all. Livestock are taught to become comfortable around humans and to follow into a new paddock each week. The system is no stress, and low input, allowing us to enjoy farming more and providing extra time for other activities; from growing more of our own food; to starting this website; to sharing our farm with others.